Taste test: These are pretty good vinegar chips. The chips in this bag seemed to be about equally divided between chips with light vinegar taste and somewhat stronger ones that I'd rate as medium-strength vinegar. Overall, you get a good vinegar kick without going overboard. I was very impressed by the huge number of chips they managed to pack into this small bag. Smell test: Mild but nice vinegar smell. From the package: “If this product is not fresh, simply return the package and its contents for our analysis. Please state where and when the product was purchased.” ... Ingredients include salt, lactose, citric acid, B.H.A. and B.H.T. 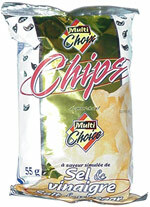 This snack was discovered by Jeremy at Ultramar gas station, Route 276, St.-Joseph, Quebec, Canada.